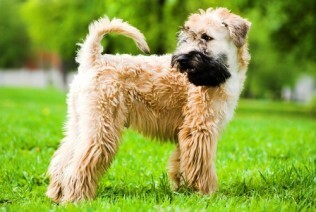 COLOR(S): Whole-colored and preferably red, red wheaten, golden red or yellow-red. A small amount of white on the chest is acceptable. The American Foxhound is a medium-sized to large-sized muscular dog. It has a long, broad head, medium-length drop ears and and large, brown eyes. The muzzle is straight and square, it's straight legs, back and tail are all long. They are distinguished from their English cousins by their finer bones, more leg length and more angulated hindquarters. The American Foxhound was not bred to be a family pet, but if well socialized as a young pup they will adapt to family life. American Foxhounds have a tendency to want to roam, but will adapt to their environment if properly cared for. Foxhounds are favored as a hunting dog because they have a keen nose and a remarkable talent to instinctively bark on the fox's trail. They are energetic dogs, but very friendly and affectionate. American Foxhounds are exceptionally athletic and are very willing to work. Stubborn and independent at times, the American Foxhound takes patience in training, but can become your best friend once rules are established. The American Foxhounds is an active, energetic, tolerant, amiable, gentle and friendly dog that gets along well with people and other dogs. Most are reserved around strangers, though. The American Foxhound can be independent and stubborn making training a little more difficult. This is a cheery breed. American Foxhound need minimal grooming of their short coat. A naturally healthy breed, the American Foxhound has minimal health problems. Possible deafness, hip dysplasia, and blood platelet abnormality may sometimes occur. They have a high energy level and will require daily exercise. Be sure to provide plenty of daily exercise, and be your dog's firm, but calm, confident, consistent pack leader to avoid behavior issues. This breed needs a firm, no-nonsense leadership approach to training. This breed can be difficult to housebreak. Be aware, the American Foxhound will take off after an interesting scent if they get a chance.